After Bijra High School, where we had earlier setup the first pilot of the CASTLE (Computer-Aided Studies, Teaching and Learning Environment) initiative, it’s now the time to start rolling out the second school - Radhakantapur High School in the West Midnapore (পশ্চিম মেদিনীপুর) district of West Bengal. This time, the engineering college at Chandrakona town will act as the local partner to the project just like BCREC has done for the Bijra project. The boys - Soumen Bar and Anutosh Dutta, who will act as local support for the project at Radhakantapur, arrived in the city on Sunday. However, I still needed some volunteers to work on the deployment readiness phase of the project, and so sent out a call to the WBUT-LUG members. Within, 15 minutes, 13 of them (from 2nd and 3rd Year BTech IT) had enthusiastically responded. The teams are in place. I’m visiting the school today for a site survey. Soumen will be accompanying me. He will liaison with the school in getting the site ready after we make the necessary recommendations. The project implementation ETA - 15th of May, 2008. What’s wrong with the geeky HOWTOs? This is a story that unfolded around a discussion on using KGeography in the classrooms. Managing the transition to FOSS in ICT-bridging scenarios like Bijra has been a revelation. The results are reinforcing my deeply held belief, that far more that FOSS software and tools, its Open Access / Commons content that are needed to drive the uptake. A look at proprietory / patent encumbered formats (Adobe Flash / mp3 for instances), and we know why this is so. There is just **SO** much freely available (as in muft) content for the taking… add to that the bulk of the commercially produced / govt / institution sponsored content that are coming online around the globe and in India. At our LTSP-based CASTLELabs deployment at the Bijra High School, Durgapur, the students and the teachers alike had taken, like proverbial ducks to the water, to tools like KGeography. But there is a problem… there are *NO* India specific detailed maps in the package. This was of course, not surprising! It was fairly good! And it was also just plain WRONG! If we wanted the experiment to get the geography and history and language and science teachers to collaborate, really scale, then we needed to speak in THEIR terms, and NOT speak __to__ them in our langauge. To put it simply, we needed to take an activity oriented approach. So instead of talking tech to the geography teachers about XML layouts, lets discuss with them in terms of drawing maps, colouring them, adding them and creating questions and interactive activities around the maps - Activities with which they are already familiar on a traditional, non ICT basis. Of course, the technology aspect won’t go away. But rather than being in-your-face, it should be specific and focussed on a step-wise description of the exact part of a tool or a technique, applicable for getting a desired activity going in the right direction. Arindam did do a re-make of his effort… the activity oriented approach draft exercise is over here -> How to add maps! Geeky howtos are excellent resources, and yet they do not scale in case of main-stream use as functional documentation. For ICT bridge scenarios, they can certainly come in, but only at a later stage and specifically for the emerging potential power users. Aabida Jamadar is a student of Class IX at Bijra High School. Soon after the CASTLELabs deployment at the school on 14 - 15th of November, Kushal shot this interview video. To me, this video really exemplifies what we are trying to do - to reach out, both in terms of technology as well as the more controversial topic of pedagogy. I had been wanting to work on the post-production and sub-title this interview. Today I finally found the time. Here is the finished video. Many thanks to Kushal for shooting this spot-on interview. Much of the credits for the success, go to my friends and colleagues from the Ankur Bangla Project, especially Deepayan’s Bangla Archive Project. Kids just love it! A small video of the reactions of a young city-based kid to the OLPC XO. The editing, subtitling and title card creation was done using Kino and Gimp. The video was shot using a Canon Powershot A610 digicam. This is my first attempt at doing something like this, so rough edges and bad technique is to be expected The uploaded version has loss of details, thanks to conversion and compression, it’s not *this* bad in the final edited version on my lappy. chess on one of our CASTLE Labs terminals. On the last day of the exhibition, Satabdi and Debamitra from AID India came over. They too wanted to go and visit the Bijra High School project site. Probably we’ll all go for a visit on Tuesday (the 11th). Mr. Arup Chakraborty - a member of ILUG-CAL.ORG and a key person with the Kolkata efforts of Indian Assn. for Blind Persons, came down as well, along with a colleague. They are presently using Orca screen reader and are interested in getting it to work with Bengali Unicode text. They have expressed a keen interest in closely working with ILUG-CAL in setting up a training program for the visually challenged persons in using Free and Open Source Software. We all agreed to establish a base-line reference for the program within December 2007. Bal Vividha drew to a close on Sunday, 9th December. Chandita from Comet Media Foundation, Amit from OLPC India and myself, we all sat down for a quick review. We drew up the tentative plans have a program on ICT in Education at Mumbai during the 3rd week of February, 2008. Today we had our visitors - the kids!!! KGeography, KHangman and the huge trove of games proved to be a _H_U_G_E_ hit. Some kids even asked how to get the net connection going on the systems and how to view movie CDs. The OLPC XOs which were on the first-ever public display in these parts of the world was a major hit as well. I spent quite a bit of time with Amit from the OLPC India team discussing the project’s progress in India and possible plans for West Bengal and the east. In between we went down to WBUT and had a meeting with Prof. Thakur as well. Also had a nice chat with Lajpat, the guy who volunteered me his Ubuntu lappy yesterday. It was a good exchange of ideas. Also got Parantapa to meet with Jitendra, the lead devel for the Physics engine for the Virtual Lab authoring software from IIIT Hyderabad. Tomorrow promises to be a busy day. In the meanwhile here are some of the pictures from the first two days. Went in early today to setup stall… found that others (Dr. Rituparna Chaki of CSE Dept, WBUT and other WBUT volunteers and staff) were already there. We didn’t yet have an electrical connection, so Rituparna-di had poked the BITM staff for one. The connection arrived soon enough, but without a proper ground. The OLPC-India guys at the next stall managed to escalate the issue and got it fixed for all. Thanks a bunch guys! Meanwhile I managed to get hold Mr. Chaudhury, the Curator. He promised me that our flex stands, additional tables that I had requested for would arrive soon. True to his words, things worked out within the next hour or so. In the meantime, I did a quick-n-dirty orientation of LTSP and BN-IN interface for the two volunteers - Ira and Suparna (both ME students). Atanu informed me that one of the 12V DC TFT monitors have gone kaput and so one of the thin-clients we had fetched from untested stock. Therefore, leaving Rituparna-di in charge, I took Atanu and went back to WBUT for replacements as well as the LCD projector. Unlike the day before yesterday, the driver I had with me today (Rajesh) was a good one who knew the bylanes et al nicely and we were soon at office. I had planned to be back in 1 hour as I still had my presentation to prepare for my talk in the post-lunch session - “Innovative Experiments in using Technology within Schools”. However it was double of that. All thanks to Oishila and a loose CAT6 jack at WBUT. Somehow managed to fix that and left for BITM again. On my way back, I got a call from Parantapa (a final year engg. student from BESU). He had come down to the stall to volunteer. It was great to see at least one person responding to my call for volunteers on the LUG list. He was a big help and has promised to come back tomorrow. Interestingly the first batch of visitors we had at the stall was a group of relatively elderly ladies from Mumbai. Wearing burkhas and speaking only Hindi (with us at least), they demanded to be explained what was on the show. The volunteers were slightly at a loss in handling the group, partly due to not being fluent in Hindi, so I stepped in to the rescue .Turns out the ladies were housewives from Mumbai, on vacation in Kolkata and decided to walk in on seeing an exhibition. But it has to be said that they were very keen on learning all about it. The second session at the Auditorium, started off at around 2:45 PM. I was to speak on the Bijra Project initiative and my slides weren’t in shape yet. Met the guys from Pratham, they were really interested in the Bijra Project and want to visit Bijra. Nizam bhai who was there, promised them all the help they may need locally. At the session, there were a total of 3 speakers. Me, Arundhati from an NGO called Pragati and Dr. Jayanthi Sivaswamy from IIIT Hyderabad. I was the first speaker, however my F7 loaded Macbook’s projector display played hookey. When I had nearly resigned to the fact of speaking extempore, a guy from the audience, came up to me and asked if I would be comfy with presenting using his Ubuntu Laptop. Whoa!!! I finished my presentation using his Compaq lappy, he also had the mpeg codecs loaded so I could also play my videos. It felt really nice! Dr. Jayanthi’s presentation was really interesting, she spoke about and demoed a Virtual Lab Authoring s/w for Physics, written using VC++ and OpenGL, the project being funded by Media Labs Asia. During the Q/A session, when she mentioned that the software would be given to school for free, I quizzed her about the degree of “free”-ness she was referring to. Her answer was straight and simple - GNU GPL. So I requested her to put up the project on sf.net asap as it looked rather interesting and useful stuff. She agreed. Later I got together with her team’s lead devel who is also attending. We exchanged cards and Dr. Jayanthi asked me if she could access some of the young local FOSS talent pools to further develop the software in a collaborative fashion. The session closed with the screening of a film by Comet Media Foundation. It was a inspirational piece. Rather nicely done in my opinion. The credits screen had one more item was interest. The film was funded by Hivos. I came back to the stall, and finally had my lunch around 5:45, since visitors’ streams ended up by six, we decided to wrap it up and call it a day. I went back to WBUT for a briefing session with Prof. Thakur, who in return shared with me the details of his meeting at FOSS.IN. Looking back it was a rather fruitful day. Tomorrow I plan on spending some time with the OLPC India team, particularly Amit (Gogna) who has been leading the Khairat pilot in Maharashtra. The first CASTLE deployment D-Day is here… Finally! One of the first projects to utilize the L2C2 framework, was CASTLE (Computer Aided Studies, Teaching and Learning Environment). We had first visualised the concept way back in mid-2004. Yet we had not been very successful in rolling it out at large. All that changes tomorrow! Thats because the computer systems will be reaching the Bijra High School at Durgapur by noon tomorrow. These thin-clients are powered by Free / Libre software, feature quick and tidy disaster recovery, are largely plug-n-play, have low power consumption requirements and have an almost zero-administration cost. However, the focus is principally on the customized content, both in Bengali as well as English along with a plethora of edutainment software. 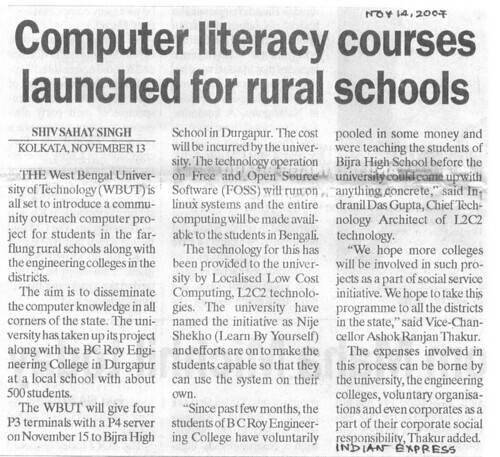 The Bijra project has been an exciting case of indigenous development and use of FOSS, nurtured by the young volunteers of BC Roy Engg College and DGPLUG members. Of course, none of these would have been possible without WBUT’s unstinting support to FOSS. WBUT is incidentally donating the systems on which CASTLE is being rolled out at the Durgapur school. More from Bijra tomorrow. You are currently browsing the archives for the Nije Shikhi category.